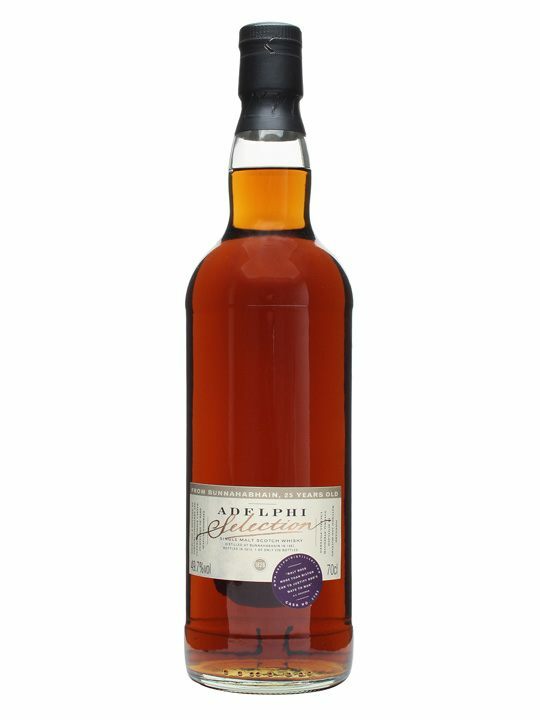 From independent bottlers Adelphi comes a bottling of Bunnahabhain 25 year old, distilled in 1987 and matured in sherry casks until 2011. Bunnhabhain is a distillery located on the Isle of Islay. It is therefore no surprise that it is famous for its peaty style, but this 25 year old Bunnahabhain has none of that typical peaty character for which the distillery is much loved. The issue with older whiskies from Bunnahabhain, or other distilleries famous for peat for that matter, is that the aroma and taste of peat tends to fade over time as the whisky rests in the oak casks. Peat is used to dry the barley that is used to make the wort which is distilled into new make spirit. When that new make is placed into oak casks, the new make begins to absorb the flavours of the oak and the peat flavours gradually fade over time. This old Bunnahabhain is therefore not peaty at all, and is instead a rounded and superbly clean whisky that offers cherry pie, dates and grassy notes that intermingle with vanillas, salted honeycomb and vibrant overtones of sherry. It is an incredibly smooth whisky, but hardly remarkable in my opinion and on the verge of boring. That said, it is a balanced whisky that is best enjoyed while your partner beats your socks off at chess – strange, that’s exactly how I enjoyed it.